During its big Apple Watch announcement last month, Apple also unveiled a major new iPhone-related initiative that could make a real difference for medical research and treatments in the near future. And on Tuesday, Apple revealed that this new app framework is now available to anyone interested in developing special research apps for the iPhone. Called ResearchKit, the new software framework lets medical researchers come up with clever medical apps that can be used to study certain diseases by looking at data that can be easily gathered with the help of the various sensors that are found inside the iPhone. Initially, only a handful of ResearchKit apps were available to interested users and they’ve already been generating huge interest among iPhone owners looking to take part in various studies. Apple says that some 60,000 iPhone users have so far enrolled in medical studies that were first demoed during the Apple Watch launch event. The study and active tasks modules offer researchers templates of creating medical surveys and ways of enabling data collection from certain sensors (including motor activities, fitness, cognition and voice). Developers looking to start work on ResearchKit apps can read more about it on Apple’s special resource pages (available here and here). The full press release follows below. The open source framework allows any medical researcher to take advantage of the initial modules in ResearchKit to study health and wellness and better understand disease. Developers can also build new modules based on the open source code and contribute them to ResearchKit. The initial customizable modules address the most common elements found in research studies—participant consent, surveys and active tasks. Participant consent: Participant consent is a critical element to research studies, and with ResearchKit researchers can access a visual e-consent template that can be customized to explain the details of the study and obtain participant signatures. This module makes it easy for the researcher to include elements such as video segments explaining the study and an interactive quiz to confirm the participant’s understanding. Surveys: The survey module provides a pre-built user interface that makes it easy to customize questions and answers for study participants to complete and immediately share with researchers. Active Tasks: The Active Task module enables researchers to gather more targeted data for their study by inviting participants to perform activities that generate data using iPhone’s advanced sensors. Initial Active Task modules include tasks to measure motor activities, fitness, cognition and voice, and with the framework available as open source, the research community can contribute even more active tasks to ResearchKit. ResearchKit turns iPhone into a powerful tool for medical research. When granted permission by the participant, ResearchKit apps can access data from advanced iPhone sensors like the accelerometer, gyroscope, microphone and GPS to gain insight into a participant’s activity levels, motor impairments, memory and more. 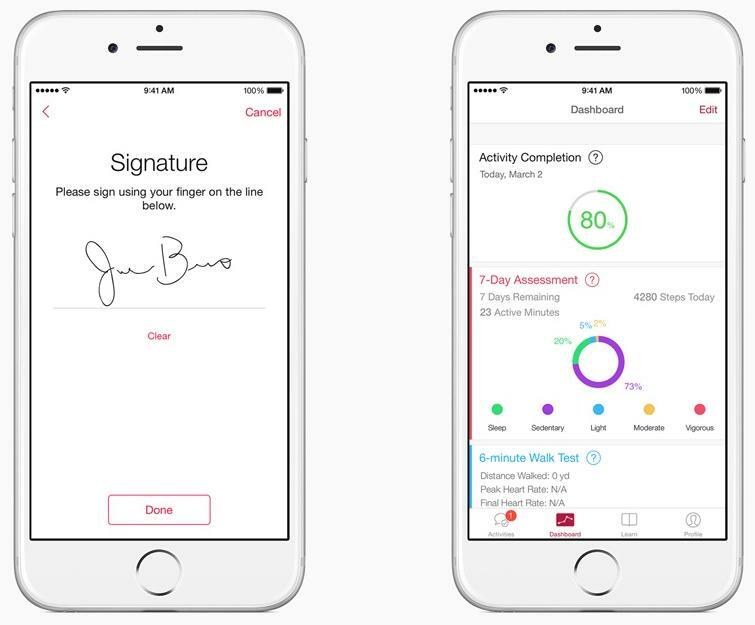 ResearchKit works seamlessly with HealthKit™, a software framework Apple introduced with iOS 8 to provide developers the ability for health and fitness apps to communicate with each other. With permission from the participant, ResearchKit apps can access and use data from the Health app such as weight, blood pressure, glucose levels and asthma inhaler use, which are measured by third-party devices and apps. For more information on ResearchKit, visit http://www.apple.com/researchkit and for details on how to access the open source framework, visit http://www.researchkit.org. *ResearchKit apps are available on the App Store in the US at http://www.appstore.com/researchkit and will be rolling out to more countries in the future. iPhone 5, iPhone 5s, iPhone 6, iPhone 6 Plus and the latest generation of iPod touch® support ResearchKit apps. Will Apple be able to clean up its Apple Watch launch date mess in time?